#NaNoWriMo: It means I'm going to be busy. Maybe you can help? You are at:Home»Lifestyle»Blogging»#NaNoWriMo: It means I’m going to be busy. Maybe you can help? So, you know I’ve been working on a book… for, like, 2 years. I mean, not always working on it for 2 years. More like I really worked on it about 2 years ago, then I’ve added a couple paragraphs every few months ever since. Anyway, I’m ready to be done with it. I want 2012 to be about revisions, editing (oh, there will be MUCH editing), and hopefully pitching, and maybe even finding an agent. I don’t want 2012 to be about writing it. 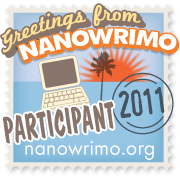 I heard about NaNoWriMo (National Novel Writing Month) last week, and on November 1st I said to hell with it, I’m in. I’ve committed to writing 1,675 words a day in the month of November. My goal is to be done with this book by December 1st (well, at least the first draft). I write well over 1,675 words a day between my posts here, my tweets, emails, and freelance projects. It shouldn’t be hard, but it will mean some of those things will have to take a back seat. My posts here will likely be be brief, lots of pictures, fewer words, and lots of Mommy Truths. Actually, I think I’d like to open my Mommy Truths series up to guest submissions. If you’ve got a funny or sweet mommy truth to share (or daddy truth! ), send it my way. Jill at babyrabies dot com. Please title it Mommy Truth (or Daddy Truth) so that I can quickly filter it into the right folder. Please keep it brief (think Tweet length, 140 characters-ish). Please don’t get upset if I don’t publish it right away or get back to you right away. Please understand I may not be able to publish it at all. Please include your blog url if you’d like me to link it back to you, but you don’t have to have a blog to submit one. You all never fail to crack me up and make me smile, so I can’t wait to read what you submit! Previous ArticleNo really, WHERE ARE YOUR PANTS? I feel a 2012 blogger book deal blitz coming on. That is awesome! You can do it!